Metal Lockers — Specialties Direct Inc. 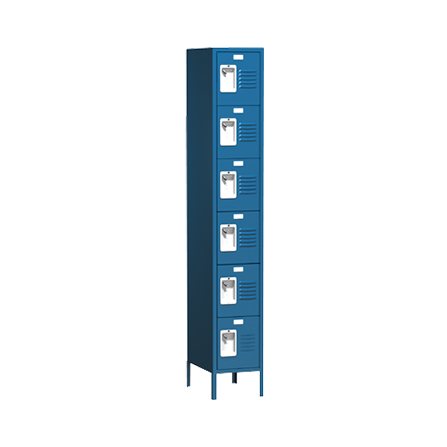 Featuring 16 gauge doors, frames and bottoms and 24 gauge tops, sides, backs and shelves, all Traditional lockers come standard with features that allow for easy and quiet operation. The Competitor Collection offers the ultimate in ventilation and visibility combined with strength and visual appeal. This collection, available in one- through six-tier configurations, features 14 gauge doors and 18 gauge backs; all other components are 16 gauge. Provides extra security by using the principles of a fulcrum to transfer the rotary motion of a handle-turn into the vertical actuation of two positive-action locking bolts that engage with the frame at the top and bottom of the door, and a center latch engaging at the side.